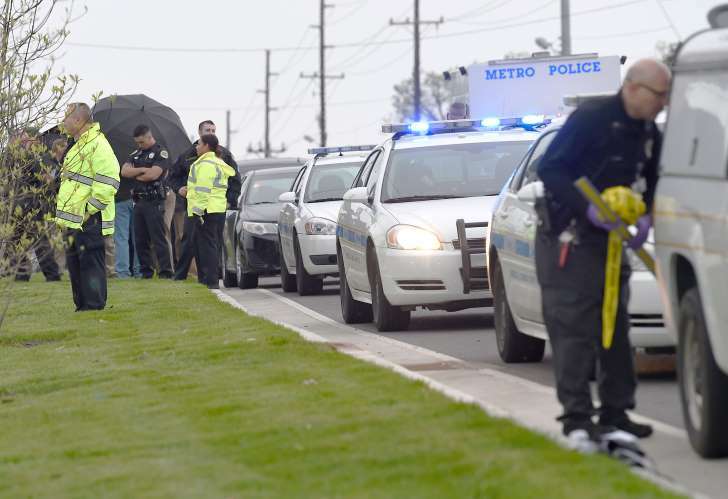 © George Walker IV / The Tennessea Four people died after a gunman opened fire at a Waffle House in Antioch early Sunday, April 22, 2018, before a patron wrestled the gun away, according to Metro Nashville Police. The gunman said nothing before opening fire with an assault rifle and killing four people at an Antioch Waffle House. A witness to the Sunday morning shooting said the gunman got out of his vehicle "naked except for a jacket" and moved with lethal efficiency. "He did not say anything," said Chuck Cordero, 50, who was at the Waffle House. "He pulled up, got out of his car and was all business." Cordero had stopped by for a coffee when he saw the gunman shoot through the window of the restaurant and at two men outside before heading in and opening fire once more. Cordero described running and hiding behind his car while gunshots echoed across the parking lot. "My heart was beating, my limbs weren't working. I tried to run and I fell," Cordero said. "I'm not a coward, but I was very scared."